Gardiren is the principal settlement of Nephshire on the northern frontier of Kaldor. It lies on the eastern bank of the fast-moving River Shem, twenty leagues north of Tashal. Vast forests claimed by the Taelda barbarians extend north and east to the Sorkin Mountains. These rich forests and centuries of trade with Azadmere have been sources of great wealth for Clan Curo, a wealthy and ancient clan led by the proud Earls of Neph. 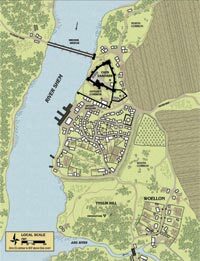 Caer Gardiren's excellent river port and its control of Medrik Bridge, the only crossing of the Shem north of Heru, ensure control of northern traffic using Noron's Way. Gardiren is also the western terminus of the Silver Way, the rugged trail leading to the mysterious and fabulously wealthy Kingdom of Azadmere. Includes The Jug Inn expansion. The Jug Inn sits in a prime location just south of Gardiren's wharf and offers a magnificent view over the Shem River. Trivin of Jasath, the proprietor, caters mainly to wealthy guildsmen and nobles. He discourages riffraff by keeping the room rates high and by serving only fine food and expensive wines and brandies. Trivin is an important man in town and has a very inquisitive nature; he is always seeking to uncover any secrets his guests may have. The Jug Inn is a location expansion intended for use with the Gardiren Castle article (COL #5623). It describes the establishment, its services, staff, and clientele. Full-color plans of the inn are included, along with several adventure hooks the GM can use to bring the location into play.